Tim Altman. breathing coach and naturopath (www.timaltman.com.au) discusses some fantastic and simple to learn, natural solutions to asthma, that more often than not, will help you wean off your asthma medication for good. Most people accept that the medical treatment of asthma using pharmaceutical drugs, such as preventers, relievers and the modern combination medicines of these two, is the only effective way to manage asthma long term. Research has started to suggest that what is often diagnosed by GP’s as asthma is more likely breathing difficulty (in about 80% of cases). As such, the main pathology in most asthma is to do with dysfunctional breathing. This is not surprrising given the average person breathes nowhere near what is considered functional, according to medical diagnostic norms. We breathe twice as often as we should, and with far too much volume (meaning that we over breathe), using our mouth and chest/shoulders to breathe, rather than mostly our nose and diaphragm. In fact, when not exercising we should use our nose and diaphragm only. This over breathing upsets the delicate biochemical balance in our respiratory system that dictates how much oxygen we get from the air we inhale into our lungs to the cells of our body for energy production (the mechanics of which are described by the ‘Bohr Effect’). If we breathe too much, we fail to produce energy efficiently, and the body perceives this as a threat to survival, so it creates constriction and spasm of the tubes that service our lungs and respiratory system to prevent the excessive loss of air; which are the symptoms we see as asthma and breathing difficulty. As such, whilst we must also address immune hypersensitivity in some cases, the treatment priority needs to be correcting breathing function – eliminating over breathing by retraining the breathing to functional levels, breathing more slowly and with less volume. This will naturally dilate the whole respiratory system and prevent, or make it far less likely that asthma and breathing difficulties will occur at all. 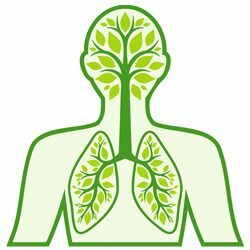 We use biofeedback technology (Capnometry) to assess a person’s breathing, and retrain them using specifically created breathing rhythms that retrain your breathing from the level you are at. There are other breathing techniques that we can also to facilitate or speed up this process also. For example, we know that a 45 second breath hold will produce roughly the equivalent vasodilation in your lungs as a puff of Ventolin. I have found that using breathing retaining to treat and prevent asthma to be a simple and easy to learn solution that will give most clients a permanent solution to their asthma and breathing difficulties with a couple of months. It takes practice and some persistence, but it provides a long term solution, that avoids the expense and negative side effects of long term use of medications. The only side effect of breathing retraining, other than being free of symptoms of asthma and breathing difficulties, are that you will feel more relaxed, and have more energy!! Contact me at tim@timaltman.com.au or 0425 739 918 to make an appointment. I offer clinical sessions online, or n person in Torquay, Barwon Heads at 13th Beach Health Services – www.13thbeachhealthservices.com.au) and Melbourne.